A small, densely populated country located in the heart of east central Africa, Burundi is one of the poorest nations in the world. It also has experienced some of the most serious and violent conflicts on the African continent. These conflicts are rooted in a struggle for control between the country’s two main ethnic groups, the Tutsi and the Hutu. Located just south of the equator, Burundi is a land of rolling hills and lakes. There are spectacular escarpments in the northeast and savannas in the southwest. Bujumbura, the capital, sits along the shore of Lake Tanganyika, which forms the country’s southwestern border. Much of Burundi’s original forest has been cut down, with woodlands remaining mostly on upper mountain slopes. Burundi’s wildlife includes antelopes, baboons, and warthogs, but poaching—illegal hunting—has taken a toll on many species, including the elephant. Although Burundi lies near the equator, its high elevation keeps the climate mild year-round. Rainfall is fairly evenly distributed throughout the year except for a dry season from May to August. Although soil erosion is a serious problem in hilly areas, the rich soil in the larger river valleys provides good conditions for farming. Burundi’s economy is based primarily on agriculture. The main commercial crops are coffee, cotton, and tea. Coffee, the leading cash crop, accounts for the majority of the nation’s export earnings. Most agriculture, however, consists of subsistence farming of food crops such as beans, corn, cassava, and sorghum. Raising livestock such as cattle, sheep, and goats, is also important. Burundi has very little industry or mining, and its poor transportation system limits industrial growth. Concentrated in Bujumbura, the country’s few industries consist of consumer goods manufacturing and food processing. In addition, political instability has damaged the economy in recent years, causing Burundi to rely heavily on foreign aid to meet its basic needs. The people of Burundi belong to three main ethnic groups—the Hutu, the Tutsi, and the Twa. The majority of the people are Hutu, and the Tutsi make up about 20 percent of the population. The Twa, a Pygmy people and the original inhabitants of the region, represent less than 1 percent of the population today. The people of Burundi speak three major languages: Rundi, French, and Swahili. Rundi, the most widely spoken, is a Bantu language. People involved in trade often use Swahili. A large percentage of the population is Christian, mostly Roman Catholic. However, many people—including some Christians—also practice traditional African religions. Although Burundi has one of the highest population densities—the number of people who inhabit each square mile—in Africa, few people live in urban areas or even in villages. Most live in small family compounds scattered around the countryside. In these isolated settlements, family members build clusters of beehive-shaped huts. Burundi’s society is made up of a hierarchy of rankings based on ethnic or clan identity. Traditionally, the Twa have occupied the lowest level. The highest social rank has consisted of princely Tutsi families, who are descended from the rulers of ancient kingdoms that occupied the region. Traditionally, the Hutu have been farmers, while the mostly tall Tutsi have raised cattle. A long history of mistrust and fear between the Hutu and Tutsi has led to periodic struggles between the two groups. In the 1970s the ethnic conflict between the Hutu and Tutsi erupted in civil war, resulting in the deaths of hundreds of thousands of people. The Hutu began migrating into Burundi around A.D. 1000; the Tutsi arrived about 400 years later. Although outnumbered by the Hutu, the Tutsi eventually gained dominance in the area and founded a number of kingdoms. By the 1800s the entire region was ruled by a Tutsi king. In 1890 Burundi and its neighbor RWANDA became part of the colony of German East Africa. In 1919, after Germany’s defeat in World War I, the League of Nations placed the region under Belgian rule. Belgian control of the territory—later known as Ruanda-Urundi—continued until 1962, when the region became the two independent nations of Rwanda and Burundi. 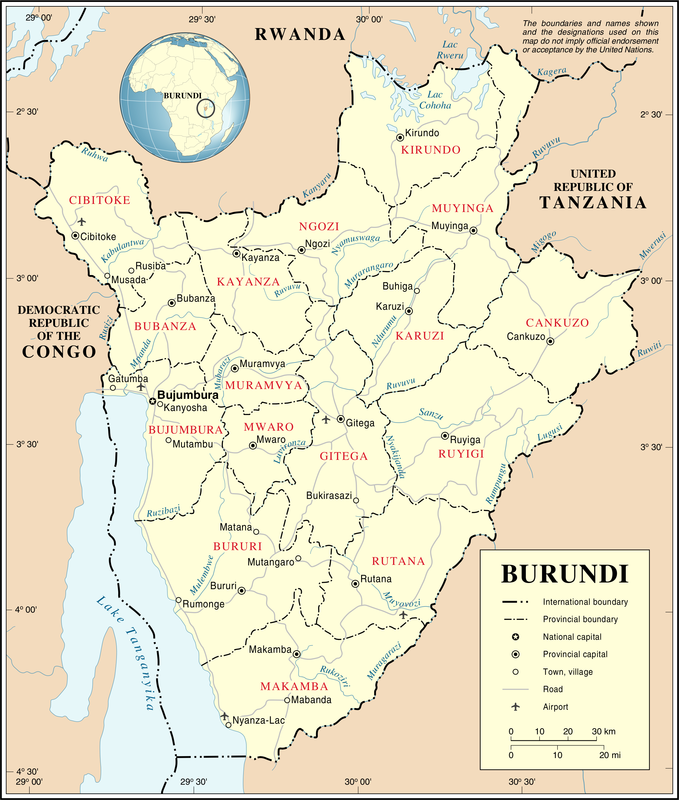 After independence on July 1, 1962, Burundi became a constitutional monarchy ruled by the Tutsi mwami, or king. Hostilities between Hutu and Tutsi began to increase over the next several years, and fighting broke out a number of times. In October 1965, a group of Hutu army officers tried to overthrow the monarchy. The attempt failed, and the Tutsi retaliated by executing many Hutu—political leaders, intellectuals, and ordinary citizens. A military coup in November 1966 ended the monarchy and led to the establishment of a republic. Michel Micombero, a Tutsi, became president of the new government. At this point, Burundi politics tended to revolve around internal struggles within the Tutsi minority. In the background, however, there loomed the threat of insurrection by the Hutu majority. In 1972 a wave of violence erupted in Burundi as the Hutu rebelled against Tutsi oppression. The uprising triggered massive attacks by the Tutsi against the Hutu. At least 100,000 Hutu were killed between April and September. The killings and repression intensified the hatred between the two groups. The attack marked an important point in the Hutu–Tutsi conflict, as it truly brought the Hutu people together because they were suffering at the hands of the Tutsis. Conflicts within the Tutsi led to the overthrow of Michel Micombero by a military coup in 1976 and the rise to power of Jean-Baptiste Bagaza, another Tutsi. Bagaza was overthrown in 1987 by another military coup led by Pierre Buyoya. Under Buyoya, Burundi was ruled by a military junta. Ethnic hostilities between Hutu and Tutsi erupted again in 1988, causing many Hutu to flee the country. Attempts by President Buyoya to reform the government and lessen ethnic divisions led to the adoption of a new constitution in 1992. The document prohibited political organizations based on ethnic identity and required political parties to include representatives from both the Hutu and Tutsi. Under this new constitution, Burundi held its first free democratic election in 1993. Hutu leader Melchior Ndadaye won the presidency in a landslide, ending nearly 30 years of Tutsi control. Ndadaye freed many political prisoners and set up an administration that was two-thirds Hutu and one-third Tutsi. However, this attempt at two-party government came to a dramatic end in October 1993, when Ndadaye was assassinated in a Tutsi-led military coup. News of Ndadaye’s assassination outraged the Hutu, who responded by killing tens of thousands of innocent Tutsi civilians. The wave of violence in 1993 was followed by attacks against the Hutu led by the largely Tutsi army, causing nearly 800,000 Hutu to flee to neighboring countries. An uneasy calm returned to Burundi when moderate leader Cyprien Ntaryamira became president in January 1994. However, his term of office came to an abrupt end the following April when the plane in which he and Rwandan president Juvenal Habyarimana were traveling crashed in suspicious circumstances. The announcement of Ntaryamira’s death had little effect in Burundi. In Rwanda, however, the death of President Habyarimana had a dramatic impact. Like Burundi, Rwanda also has a population of Hutu and Tutsi divided by ethnic rivalries. Suspicion for the crash and the death of President Habyarimana fell on Tutsi groups, setting off a wave of violence against Rwandan Tutsi. Events in Rwanda increased ethnic tension in Burundi. Tens of thousands of Hutu and Tutsi refugees fled Rwanda and sought safety in Burundi. The presence of these refugees carried the seeds of further conflict. After the death of President Ntaryamira, the Hutu leader Sylvestre Ntibantuganya became acting president of Burundi. Days later Tutsi soldiers began attacking Hutu, and a group of Tutsi tried to stage a military coup. The coup failed and outbreaks of violence continued. Growing international concern about Burundi prompted the United Nations to send advisers to study the situation in 1995. By 1996 UN reports of civil war in various parts of Burundi led the United States and many European nations to suspend their foreign aid to the country.